The Bau Tikina Access Road is closed to all heavy vehicles including buses. Confirming this, Fiji Roads Authority Chief Executive Officer John Hutchinson says the buses will continue to use the existing setup at Kasavu, on Kings Road, disembarking passengers who will need to board a second bus on the other side. 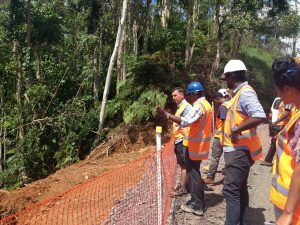 He said the Bau Tikina Access Road is an emergency by-pass route that was opened up to provide alternative access on the network as a result of the slip at Kasavu closing Kings Road. “The Bau Tikina Access Road remains open to vehicles up to a maximum weight restriction of 18 tonnes, excluding buses carrying public passengers. Mr Hutchinson has advised motorists to expect delays and inconvenience and has thanked the public for their patience.